...well spiritually at least. Picked up a box of Menoth Wracks a few days ago and decided to to a quick tutorial of how I did them. As always, before you start, paint in any spots missed by your primer. I had a few spots between the body and the wrack that were a bit tough to get to with the spray, but a some quick brushwork remedied that. I prefer to work section to section rather than doing all my basecoats, all my highlights, etc, mainly due to the drybrushing for the metal. For this tutorial, I am using GW paints only due to that what I have and I didn't wish to buy more paint that I didn't need. 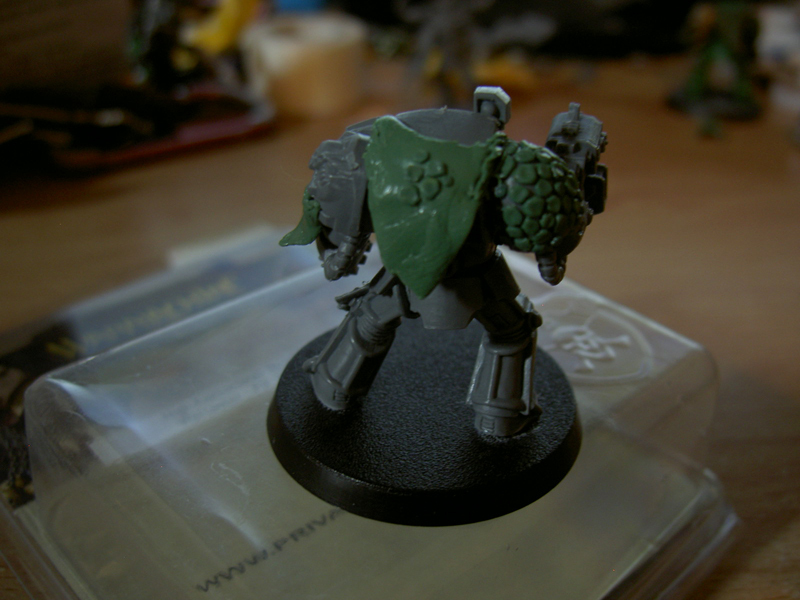 Fist I decided to tackle the Metal parts, as they were the majority of the model.I went with a dingy green look that I had done on Reznik's wrack. I liked how it came out so I figured I'd do the same for these. 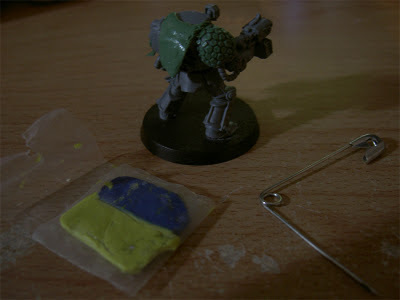 So first, I started off with a mix of roughly 50% Boltgun Metal, 25% Catchan Green, 25% Black. I then followed that up with a dry brush of Boltgun Metal, then highlights and scratches with Mithril Silver. 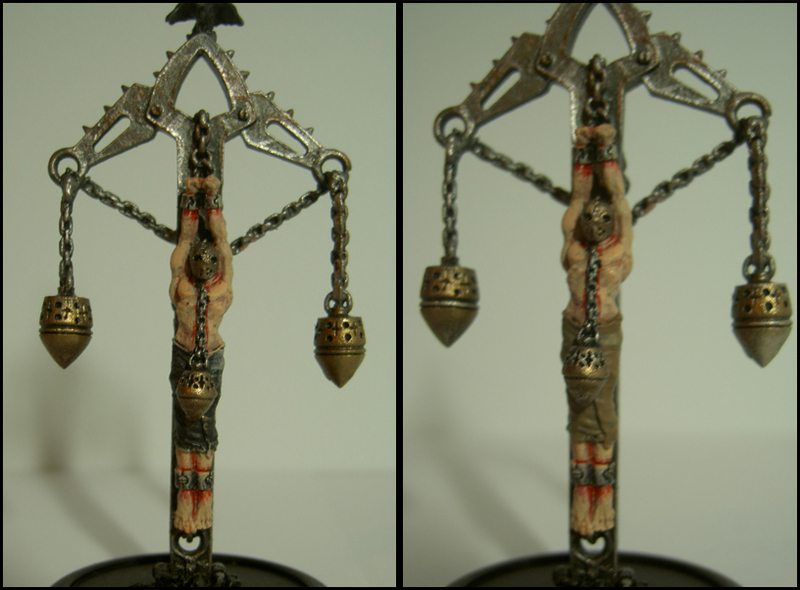 I finished it up with a bit of rust done with an even mix of Tin Bitz and Blazing Orange. I find that watering down my highlight paint helps me create more fine lines and scratches and avoids overly-bright highlights. Once the metal was done and dry, I moved on the the body. I started out with a foundation of Tallarn Flesh. The GW foundation paints are suprisingly effective and coat on very well, which is especially good for this transition from black primer to flesh tone. I then did a careful drybrush of Elf Flesh. Since the model had a lot of detail in the musculature and ribs, I found it was best to do a dry brush and let that bring out the details rather than a applying the second color normally. 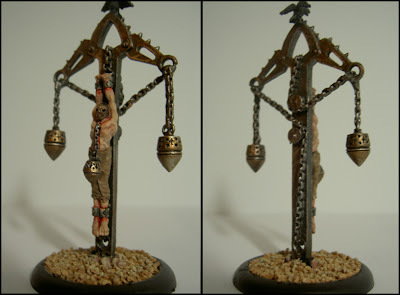 To do the blood/worn skin around the shackles, I conveniently had some old GW Red Ink laying around, which I watered down and put right in. A red wash or even watered down Blood red would work equally as good. When doing parts like this, I found it looks best if after the red is done, go back over towards the end and carefully drybrush/blend it in so that there sudden color change. After the skin was complete, I did the cloth which was Graveyard Earth with a highlight of a 50/50 mix of Graveyard Earth/Bleached Bone. 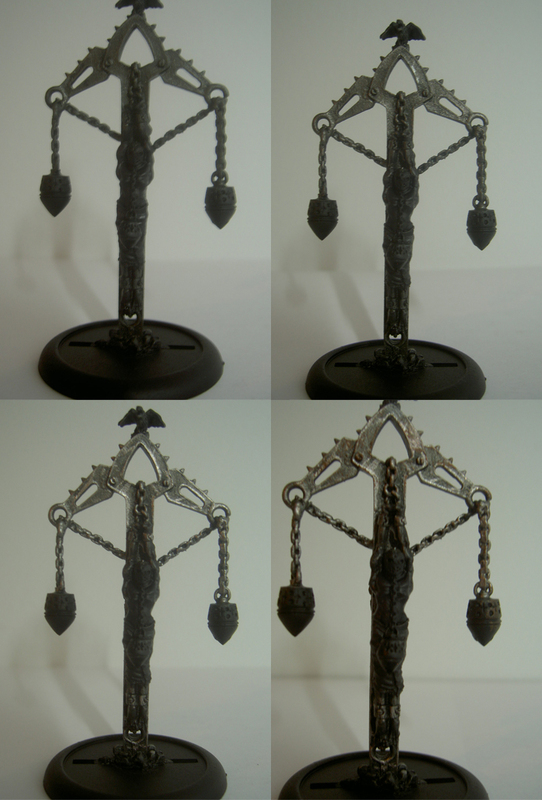 After that I moved onto the hanging censers and helmet. Those were done with an 50/50 of Boltgun Metal and Shining gold (I didn't have Burnished Gold), and then highlighted with a 50/50 mix of Mithril Silver and Shining Gold. 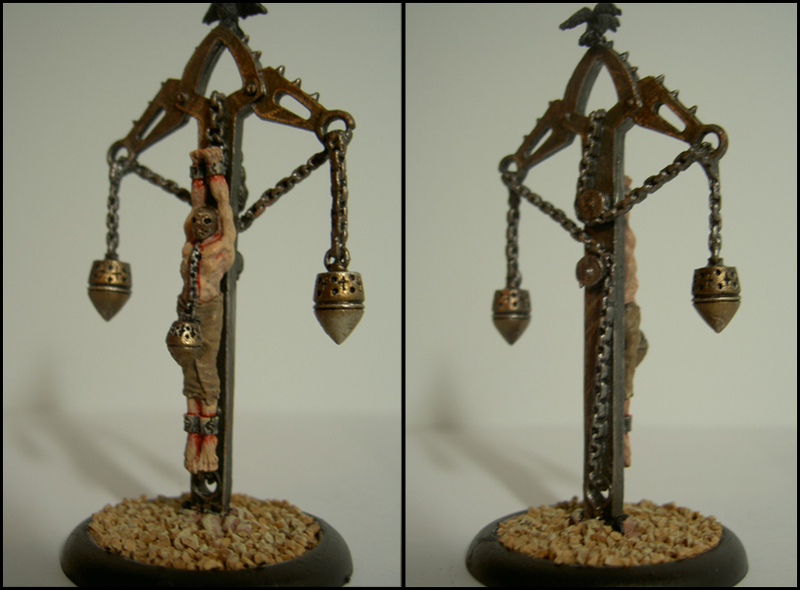 I finished up with his little buddy perched on top, giving him a simple drybrush of 50/50 Codex Grey and Chaos Black. And here is the finished result based and ready to go. Hope you enjoyed this tutorial. I will most likely have one up for other Menoth pieces in the near future. Tutorial: Big Choppas in a Pinch! Some may wonder when opening a box of Ork Boyz and surveying your Nob options: "Where da BIG Choppas?!" 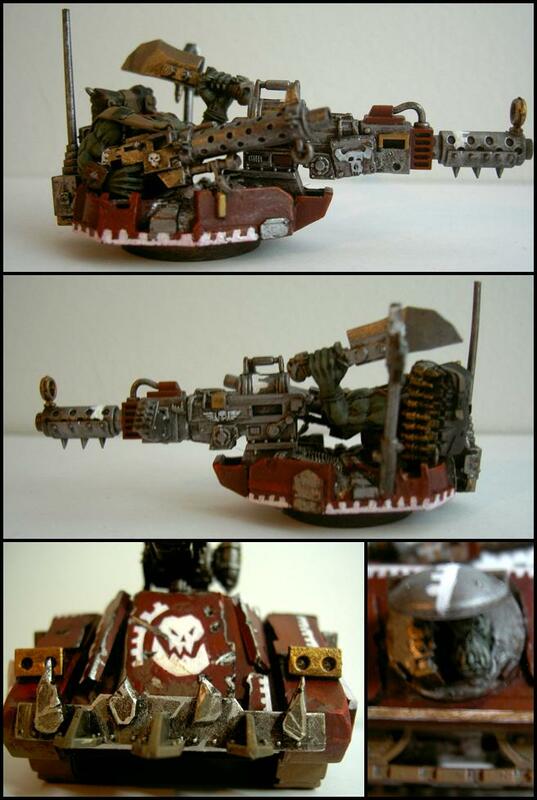 Unlike the Nobz kit, the Ork Boyz kit does not offer any bits for the two-handed Big Choppas. Through some quick converting and readily available bits, I've converted these regular Nob-sized Choppas into Big Choppas. With the bits offered to me in the Ork Boyz kit, I combined Nob Choppa arms and Choppas from the other Boyz Choppa arms (with the amount you get from both left and right arms in the kit, you should have extras.). Be sure to mind the thickness of the handle and ensure they match for the most part so it doesn't look too hodgepodge. 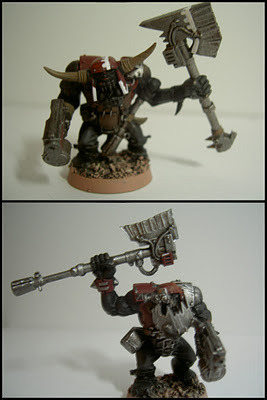 As always, be sure to cut off any bits and nubs on the bottom of the Nob Choppa and get a smooth flat cut on your ends. Above are some of the Big Choppa painted. 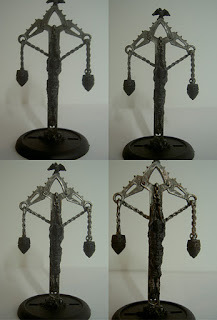 Like all my metal, I started off with a base of Tin Bitz, then drybrushing Boltgun Metal over that, then finishing with a highlight of Mithril Silver, though Chainmail works just as fine. 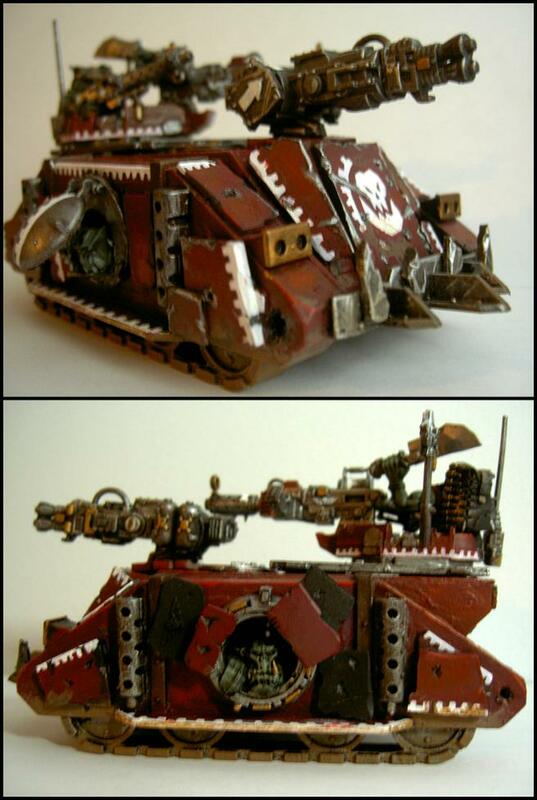 In addition to Choppas, I also used other bits such as knives and Stikkbombs, all of which in the Ork Boyz Kit. This method is also ideal for converting Nobz from the AoBR Starter set, as they are quick fit models and are not readily customizable. Have fun and happy modeling! A little while back I started to work on a Salamanders Terminator Squad, but wanted them to stand out a bit. Given the fact that I play my Salamanders as the 1st Company "Firedrakes", they really needed to be done some justice with the customization. 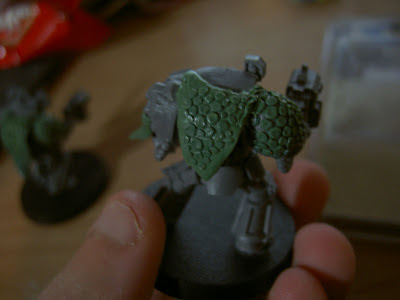 I decided each of them would be wearing a Salamander mantle and their armor feature a scaled shoulder as well. For this tutorial, I'll be showing how I did those scales. Firstly, you'll need your standard materials tools: scuplting tools, greens stuff, water tray. I don't have a set of sculpting tool, so I improvised with a safety pin. 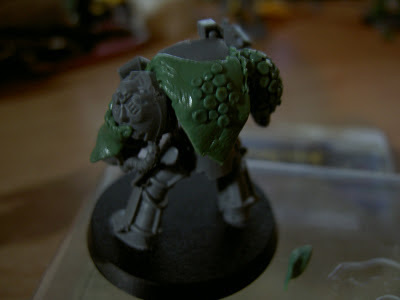 I already did the unscaled cloak on this one, and as you can see, the shoulder is already scaled as well. 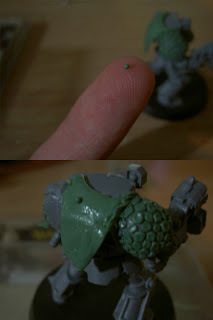 First thing you want to do pull off a tiny bit of greenstuff. Generally I keep it a standard 50/50 mix, sometimes add in a tad more yellow to get it a bit more tacky. Take the bit and roll it into a little ball between your fingers. The amount will be very small and it may get a bit annoying. I use the simple place and push method, taking the greenstuff and gently placing it on the surface from my finger, then taking the rounded cap of the safety pin and pressing it down a bit, making sure the pin is a little we so you don't pull the piece back up. I tend work from the center of the surface outwards to avoid any space issues. Once you have it in place, use the side of the sharp end to push the sides of the smushed ball to create more rounded off edges. You want to avoid circles, but also avoid any triangle like edges. Vary your shapes and sizes to create a more dynamic look. Once you've got one in, go crazy. It is quite a tedious, time consuming method, but I find the results are satisfying (and its quite relaxing in fact). Pattern your scales like above and mix up the sizes so it looks more realistic. As you push on the sides, they will generally give the scale a bit of a texture rather than just staying flat. I tend to push back down on the scale to make a little dip, then fix the sides if need be. I generally like to keep the larger scales toward the center and as I move outward, make them a bit smaller. 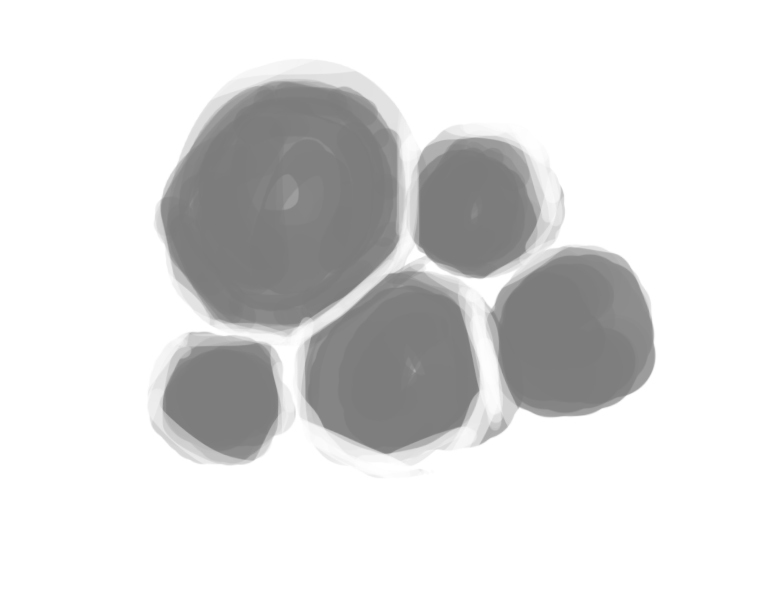 To avoid any accidental smushing as I work, I tend to skip around a bit, depending on the model/ surface area. Finally the model is complete and ready to paint. I have yet to have any issues with scales coming off despite the lack of glue. Generally the sprayed basecoat and paint seals them on good. Hope this was helpful and have fun! Starting up a Menoth force for Warmachine, look for more of them in the near future! Starting off with Servath Reznik. 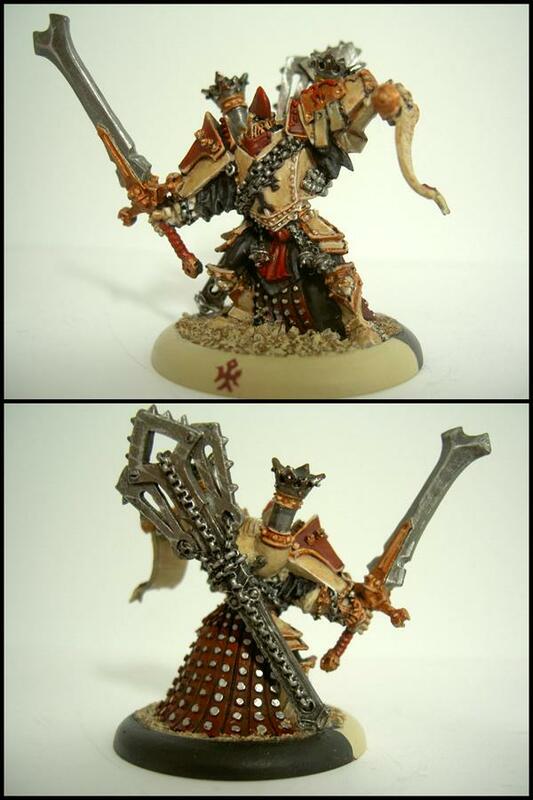 Had a fun time painting him and will probably be doing my Menoth force in a similar scheme. 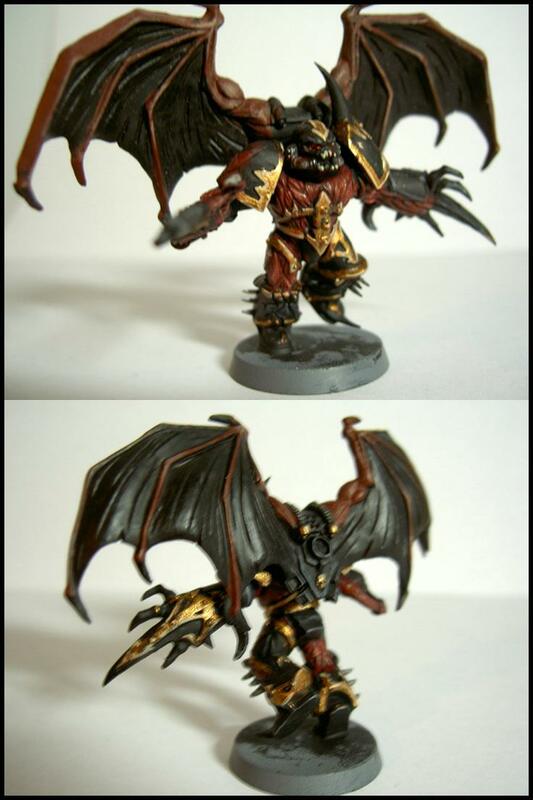 Black Legion Possessed to represent Chaos Undivided. Death Guard Possessed. Picked up a box of possessed a while back and decided to model and paint one themed to each Mark of Chaos/ Cult Legion. A current project. 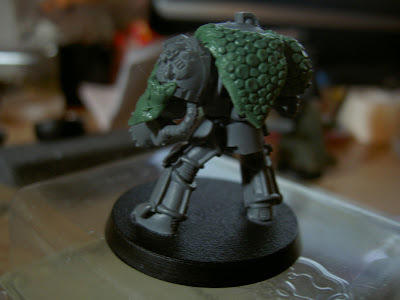 Terminator Sergeant unpainted with greenstuff sculpted drake mantles. Boss Wuzdat, leader of the Adeptuz Mekanikuz warband. Lightly converted from the AoBR warboss, with skorchy bitz. A recent retouch of an old favorite.